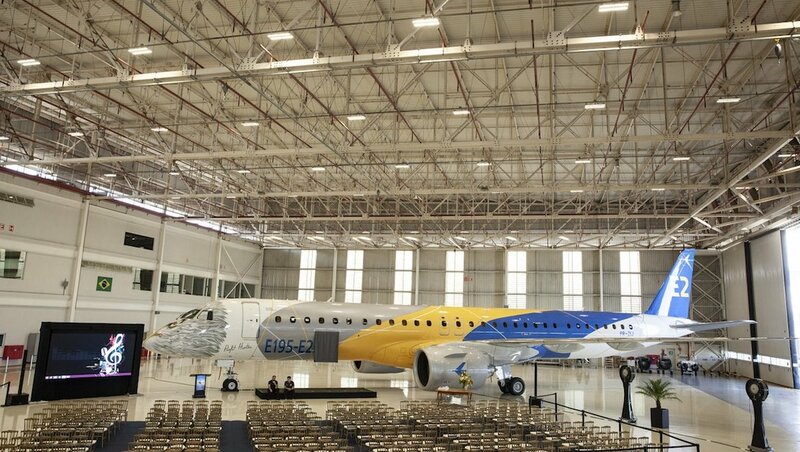 Embraer’s E195-E2 regional jet has been certified by regulators in three jurisdictions, paving the way for deliveries to begin later in calendar 2019. 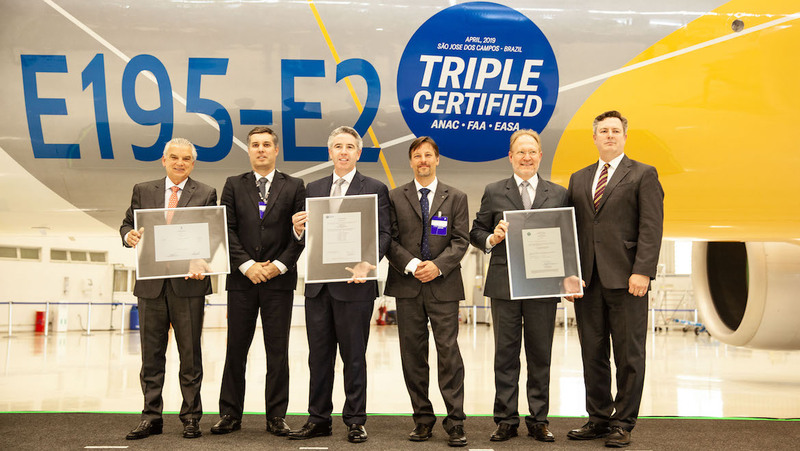 Brazil’s Agência Nacional de Aviação Civil (ANAC), the European Union Aviation Safety Agency (EASA) and the United States Federal Aviation Administration (FAA) have simultaneously granted the aircraft its type certification, Embraer said on Monday (Brazil time). Launch customer Azul has ordered six E195-E2s. Deliveries to the Brazil-headquartered airline were expected to begin in the second half of calendar 2019. Meanwhile, Canary Islands carrier Binter Canarias would also receive the first of three E195-E2 aircraft it has ordered later in 2019. The E195-E2 jet is the largest commercial aircraft produced by the Brazilian company second of three E2 variants to receive certification. The E2 program was launched in 2013 to advance the earlier range of E170, E175, E190 and E195 jets. The E2 lineup comprises the E190-E2 which was certified in March 2018, the larger E195-E2, and the E175-E2. Embraer president of commercial aviation John Slattery said a flight test on April 15 had confirmed the aircraft had performed better than its original specification, with fuel consumption 1.4 per cent lower than expected. The E195-E2 used 25.4 per cent less fuel per seat than the earlier E195. Also, Slattery said maintenance costs of the new jet were 20 per cent lower and it was the most environmentally friendly aircraft in its class with the lowest levels of external noise and emissions. 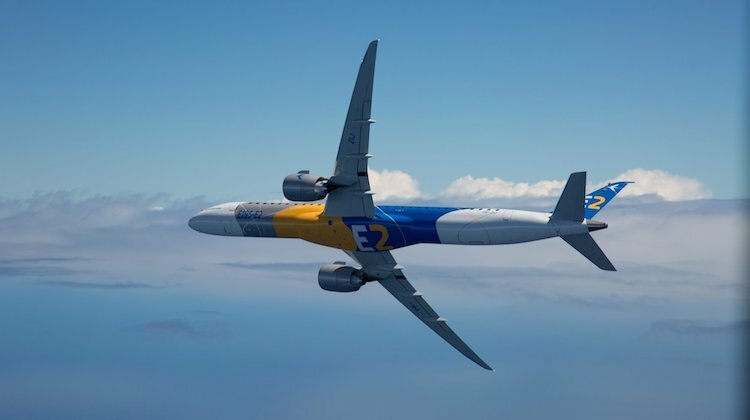 Embraer used two prototype aircraft in the E195-E2 certification campaign, one for aerodynamic and performance tests, the other for the interior and validation of maintenance tasks. Like its E2 predecessors, the company said maintenance intervals in the single-aisle jet category of 10,000 flight hours for basic checks meant an additional 15 days of aircraft utilisation over a period of 10 years, compared to current generation E-Jets. The E195-E2 was also able to serve more markets from limited airfields. The E195-E2 is powered by Pratt & Whitney PW1900 engines; it can carry up to 146 passengers in one class and has a range of 2,600 nautical miles (4,820km). It also features a new wing, new landing gear and is fullly fly-by-wire. By comparison, the first-generation E195 carried up to 124 passengers and has a 2,300nm range. 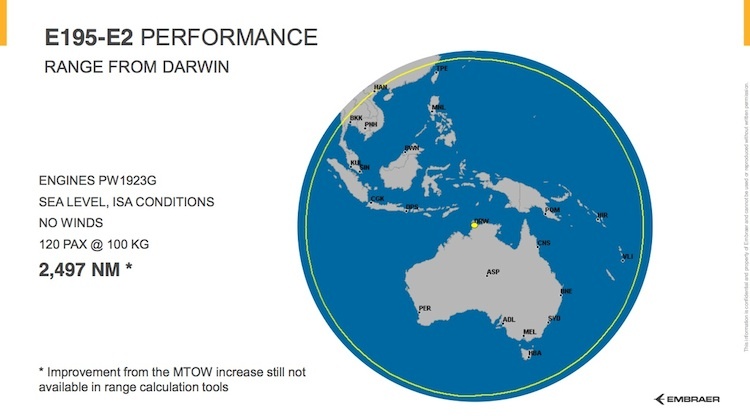 Embraer told Australian Aviation in 2017 that the E195-E2’s 2,600nm was an improvement from the previous figure of 2,450nm in 2016 when the company made changes to the wing and from 2,000nm at the launch of the E2 regional jet program in 2013. 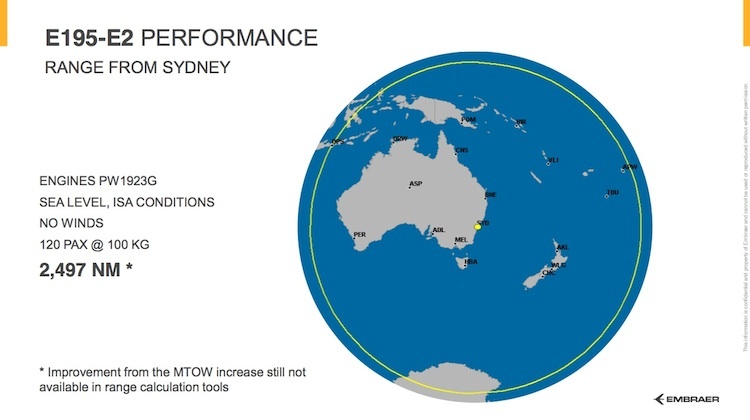 Range circles from Embraer showed the E195-E2 configured with 120 passengers would be able to fly between Sydney and Bali (2,495nm) or Sydney and Apia (2,336nm), based on certain assumptions. Embraer has received orders for a total of 111 E195-E2s to date. Other customers beside Azul and Binter Canarias include leasing companies AerCap (44 orders), and Aircastle (13) and Nigerian carrier Air Peace (10). “There’s no question that airlines are going to love this airplane’s economics. The E195-E2 is the ideal aircraft for growing regional business and complementing existing low-cost and mainline fleets,” Slattery said. North American airlines Spirit Airlines and United Airlines are reportedly considering buying E195-E2s, according aviation news publisher, FlightGlobal. The 2018 Embraer market outlook has forecast airlines around the world would require about 10,550 aircraft with up to 150 seats over a 20-year period to 2037. The figure comprised 8,230 jet aircraft, such as the E2 family, and 2,320 turboprop aircraft. Embraer reported a full year loss for calendar 2018 due to writedowns from its business jet division and lower revenueThe loss of US$178.2 million ($248.45m) for the year to December 31 2018, slipping into the red from a profit of US$264 million in the prior corresponding period. VIDEO: A look at the first flight of the E195-E2 in 2017 from the Embraer YouTube channel.